These two gentle foxes could likely be some of your favorite Thanksgiving guests. They're cleverly disguised salt and pepper shakers that are as decorative as they are useful. Of course, your food doesn't need any extra seasoning, but you mother-in-law's may. 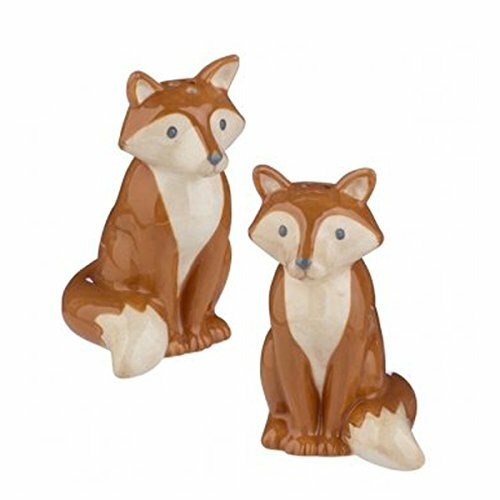 The foxes are made of Ceramic/silicone and measure 2 7/8" x 2 1/4" x 1 5/8". They have white bellies and faces with brownish red backs and paws, a sweet gray nose and black eyes. They're great for Thanksgiving dinner, but are fun to use throughout the fall and winter. Hand wash only.